I have been a 1Password user since February of 2015. Still, I'm using the standard license thingy. Do you guys have a monthly subscription for the cloud version or just the annual one? I was also confused which currency to use? Like, Canadian or European? I also can't recall if I was able to try out the cloud version though. I'm evaluating another competitor. They are cheaper and I love the feature that allows me to share some login credentials to some people. And, if given the opportunity, I would love to try out the cloud version of 1Password before making a decision. Honestly, it is hard not to use 1Password. Generally, I really love the streamlined, polished, and straightforward interface of 1Password. But for the past few months, I use passwords from Dinopass instead of generating passwords from 1Password. Do you guys have that feature, that way of generating easy to remember but secure passwords? I'll be waiting for the replies of this awesome community. I have been a 1Password user since February of 2015. Still, I'm using the standard license thingy. @ItsAdventureTime: Thanks for getting in touch, and for choosing 1Password! Do you guys have a monthly subscription for the cloud version or just the annual one? Yes. 1Password memberships have both annual and monthly billing plans available. I was also confused which currency to use? Like, Canadian or European? We've got three separate 1Password membership host servers: 1Password.com, 1Password.ca, and 1Password.eu, billed in US dollars, Canadian dollars , and Euros respectively. I do hope you'll check out 1Password memberships, but it's also good to "shop around". If you end up sticking with 1Password, we'd rather you do so because it's the best fit for you, not because you feel like you're trapped. So you can export your data and move somewhere else, or migrate to a 1Password membership account if you go with that. If I'm understanding you correctly, you'd probably need to talk to the company that makes the software you're importing the data into. 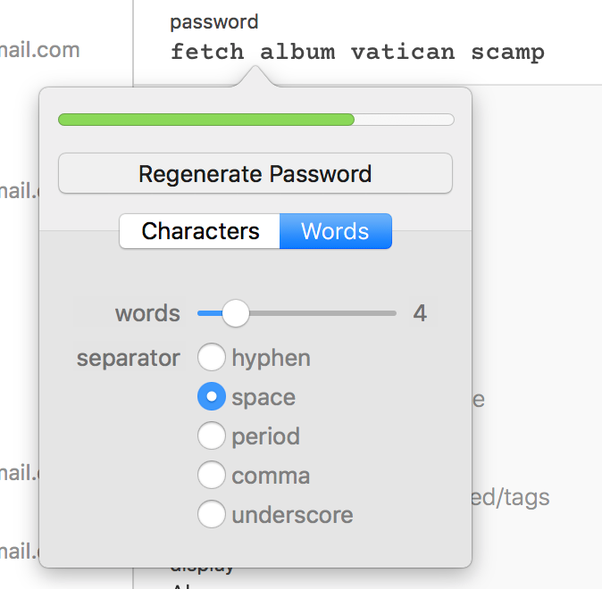 Generally Password items are used only for saving generated passwords as a safety net, but if you're using them for some specific purpose that may determine how you want to store them in the other software. It's very possible that they organize things differently than 1Password. For all the passwords you don't need to memorize and/or type regularly, character-based passwords are best, because you can get much more variance with fewer characters; but random Wordlist passwords are strong and hard to guess because of how many possibilities there are. There are a lot of great folks here. Maybe others have some other suggestions. I would like to just to officially announce this milestone that I'll be continuing my journey with 1Password! I really commend @GreigAllen for helping me by being there for my to guide me with the migration of my vaults to the cloud. I appreciate the initiative and the kind gesture as I was indeed appreciated as a loyal customer since 2015. Surprisingly, I'm given the opportunity to try out the cloud version of 1Password (goodbye Dropbox indeed) for a bit longer than the usual which gives me the time to save up for the really worthy annual fee that is realistically appropriate to my situation. Thank you good people of 1Password for being compassionate and considerate to your customers! I just have a question regarding some of my logins. I'm seeing a message that informs me that Two-factor authentication (2FA) is really supported. So, how can I make that away? I'm using Authy by default. Do you guys have your own 2FA app? Also, which is better and more secure to use? Character-based passwords or Wordlist-based passwords? I was trying to foresee myself of accessing my 1Password account in a public computer just to be able to login to my social media email accounts. I noticed entering the security key isn't really that secure because it is exposed. Can I routinely change the security key? How about the master password, can I also change it for security? 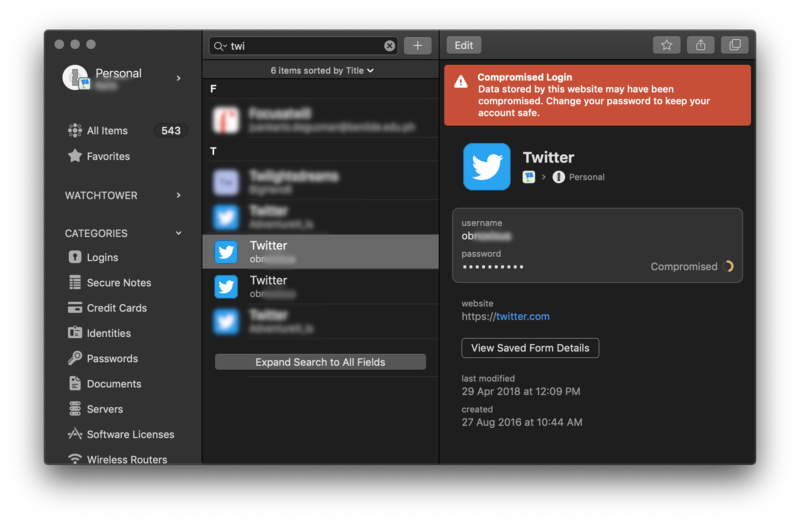 For added security, I added 1Password to Authy though. But my main concern is, if I don't have anything that has a 2FA generator with me, I guess that would be a bit of a challenge, though I would love to get your suggestions about it. Again, job well done folks! I'm glad to hear that Greig was able to help and that you'll be continuing with 1Password. As an important note though: if you're using TOTP to protect your 1Password account... your 1Password account should not be the only place that you store that TOTP secret. That'd be like locking the keys to your safe inside the safe. So secure that even you can't access it! Character based passwords are more secure, but wordlist based passwords may be handy if you need to memorize and/or type a password. For example, I find I have to type my Apple ID password somewhat regularly and it is also one I like to have memorized, so I use a wordlist based password for that. We really wouldn't recommend using a public computer, at all. With any public computer you should assume any credentials you access are compromised. The convenience of not having to carry one of your own devices is probably outweighed by having to change all of your credentials. Public computers are best avoided if at all possible. Now, obviously, if you have reason to believe your credentials are compromised (such as by having used them on a public computer) you should absolutely change them. 2FA by its nature inherently decreases convenience with the goal of increasing security. You have to have something with you that can generate that code when you want to log in. That's the tradeoff. That said, it is possible to have multiple apps / devices generate codes. 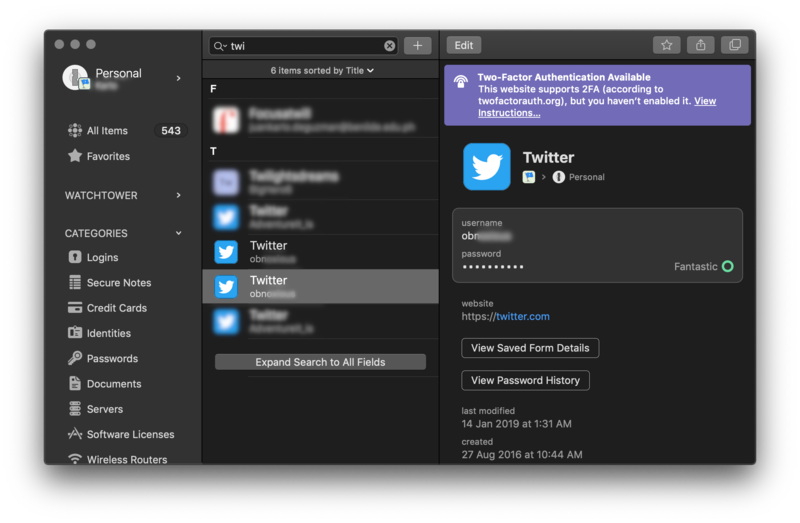 For example, I have all of my 2FA secrets both in 1Password as well as on a Yubikey. Thank you. I'll be sure to pass the feedback along to the rest of the team as well. Thanks for the awesome reply and for addressing my questions. You're very welcome. On the subject of duplicates... The duplicate detection in 1Password is quite strict. If all of the details don't match 1Password will not mark them as duplicates. That said I do see how it might be useful to have a feature that would find all logins for the same website that have the same username. I'll pass that suggestion along to the team. Thanks! I don't really know the algorithm that 1Password is using to match the duplicate entries. Maybe the hash or the created and modified timestamp, like literally the same identical credentials? Watchtower will react a lot since there are totally a lot of duplicate entries. like literally the same identical credentials? Fingers crossed. I can't make any promises. You are definitly right @ItsAdventureTime ! That's why I love 1Password too.